Paul Klee famously took ‘a line for a walk’ with his drawing, and opened up the world of art to every primary school pupil. His work is hugely popular, probably because it appeals to so many different tastes. There are the deceptively simple pure watercolour washes, with an incredible harmony of colour, and the bold lines of his more graphic works. Klee, who lived through one world war and died on the eve of the second, never lost his sense of playfulness and inventiveness. He was a skilled draughtsman and an incredible colourist, combing the abstract and the narrative. 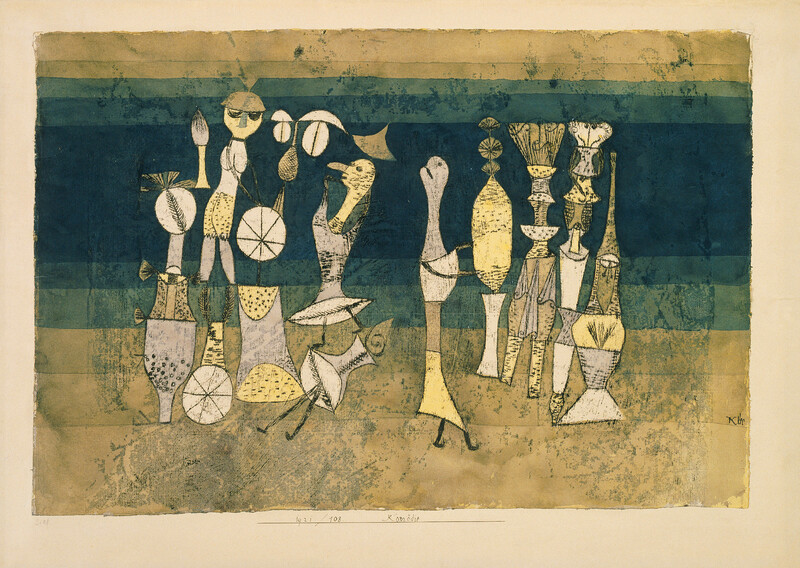 The exhibition Paul Klee: Making Visible at Tate Modern (until 9 March) presents the diversity of Klee’s output by showing his work in chronological order, so the viewer can experience the full range of styles Klee worked on at the same time. The artist had a numbering system to record his work, and here we find for example the graded colour of a scene of midnight boats at the same time as a pure abstract grid of colour blocks. To see this play of different styles progress throughout his career gives a fascinating insight into the way the artist worked. It was never one or the other, abstract and narrative happen side by side. There is a joyous balance of line and colour in these tiny paintings that remains constant throughout the highs of public acclaim, the high-profile career with the Bauhaus and then the humiliation of being branded ‘degenerative’ by the Nazis and the disease that would end his life at 62 years of age. In fact, as the war approaches, his final burst of work is bigger and brighter than ever. No matter which style of Klee’s you enjoy, this huge show of over 130 works will enable you to appreciate the ceaseless inventiveness and childlike exuberance of the artist to the full.